An attempt to answer the question of Static vs. Dynamic Methods which states "All substantive methods are necessarily dynamic." Dynamic Substantive Methods theorem was formulated by Hakob Barseghyan in 2015.1 It is currently accepted by Scientonomy community as the best available theory on the subject. By the 1980s, most philosophers of science had accepted that many of the requirements for theory acceptance are dynamic. The example of the placebo effect was used as an example of how theories induce change to the requirements of the scientific method of a community. However, philosophers still hoped that there was a more abstract and fundamental set of static requirements consistent across scientific communities. For adherents to this belief, such as John Worrall, this was typically argued to be a kind of hypothetico-deductivism. The debate between Laudan and Worrall3456 elucidated the distinction between two questions about dynamic methods. The first was an empirical question: Have there been any methods which have not changed through history? And second, a theoretical question: Are there any methods which are, in principle, immune to change? Both Worrall and Laudan agreed that there exist substantive methods, which shaped by contingent propositions about the world and therefore not static. If theories about the world are to change, then so should these methods. However, Laudan held that no methods have ever been procedural — shaped by only necessary propositions and therefore immune to change — whereas Worrall contented that certain methods, such as the hypothetico-deductive method, are in fact procedural and historically have formed the base of scientific reasoning. Dynamic Substantive Methods theorem (Barseghyan-2015) is an attempt to answer the following question: Are there any methods which are immune to change? See Static vs. Dynamic Methods for more details. A substantive method is one that presupposes at least one contingent proposition; one that depends on the state of something in the external world. According to our understanding of contingent propositions, all such propositions are fallible. As such, any substantive method will necessarily presuppose at least one contingent proposition, and is therefore fallible. Thus, by the synchronism of method rejection theorem, the rejection of a theory can result in the rejection of a method, rendering all substantive methods dynamic. This theorem explains why all substantive methods are necessarily dynamic. By definition all substantive methods contain at least one contingent proposition so they cannot be immune to change. 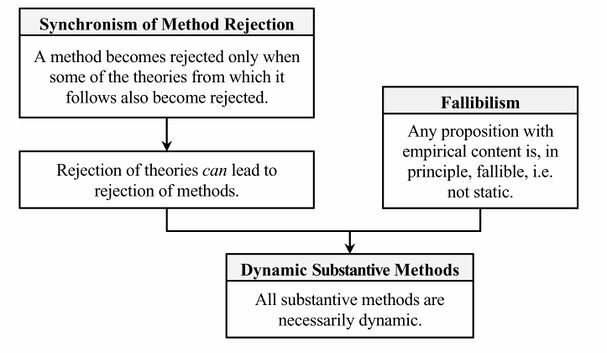 Thus, from a conjunction of: 1. fallibilism, namely the assumption that all propositions with empirical content are by definition both contingent and therefore fallible, 2. the premise that the rejection of theories can lead to the rejection of methods, and 3. the Synchronism of Method Rejection Theorem (derived in turn from the Method Rejection Theorem and the Third Law), it follows that all substantive methods are necessarily dynamic. One example is the transition from the controlled trial method to the blind trial method and then to the double blind trial method. Blind trials were introduced as an implementation of the more abstract method that required to account for the placebo effect on patients when testing drugs. Once the placebo effect became known, the method changed. And after, when it became known that the experimenter's bias also had a role on patients when testing drugs, the method changed once more, from blind to double-blind. Another example is the transition from the Aristotelian-Medieval Method to the Hypothetico-Deductive Method. While in the former it was assumed that there was an essential difference between natural and artificial, and that therefore the results of experiments, being artificial, were not to be trusted when trying to grasp the essence of things, in both the Cartesian and Newtonian worldviews such a distinction was not assumed and therefore experiments could be as reliable as observations when trying to understand the world. Once the theories changed (from the natural/artifical distinction to no such distinction) the methods changed too (from no-experiments to the experimental method). ^ ↑ Worrall, John. (1988) Review: The Value of a Fixed Methodology. The British Journal for the Philosophy of Science 39, 263-275. ^ ↑ Laudan, Larry. (1989) If It Ain't Broke, Don't Fix It. The British Journal for the Philosophy of Science 40, 369-375. ^ ↑ Worrall, John. (1989) Fix It and Be Damned: A Reply to Laudan. The British Journal for the Philosophy of Science 40, 376-388. This page was last modified on 1 April 2018, at 21:09.